Day two, gold and rainbows! I was really excited for today's theme. While my nail art didn't turn out as good as I had hoped it would, I still had fun doing it and think it's a cute design. I combined both a rainbow and a pot of gold. I thought that a pot of gold belonged at the end of the rainbow, so why not? I was debating which nail I should put the pot of gold on. I was going to put it on the pinkie so it could span across all nails, but the pinkie is just so small! So instead my pinkie just stands out since it's one solid color and doesn't look anything like the rest of the nails. At least it's a color I like! I also think it's appropriate that the ring finger nail is the accent, since it usually ends up being my accent nail. I started by painting all nails with Deborah Lippmann Almost Paradise. I then free handed the rainbow across three nails, starting with red at the top. I tried to make it arc so that the pattern would continue from nail to nail when they're next to each other. 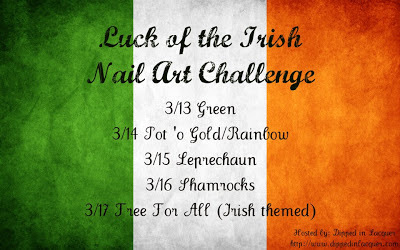 I used striping nail art polishes for the colors of the rainbow, and used a black one to free hand a pot for the gold, or a cauldron. I waited for it all to dry, and then painted a bit of gold where I wanted my microbeads to go. I then carefully poured the microbeads on, and they stuck to the wet gold polish. I put a topcoat over the microbeads to seal them in, so it looks a bit weird with topcoat in between them. I think I started to get bubbled from my Seche Vite on the textured surface. I probably should have just left the beads without topcoat so they could look even more textured! LOVE IT! Using little caviar beads for the pot of gold was so clever and it turned out really cute! Love the caviar pot of gold! I have the same issue with the bubbling between the beads. I just worried that without topcoat they'll all fall off too quickly.